Merri Stitches has been in the business of providing full-service sewing solutions since 2001. Locally owned and operated in Portsmouth, NH, we offer sewing enthusiasts the convenience of a one-stop shop for machine sales and repair services, sewing notions, machine accessories, designer fabrics, patterns…and much more! As the #1 Ranking Dealer in New England & TOP 20 in Country, our large showroom features the newest Viking Husqvarna sewing machines, along with software, accessories, and a great selection of " up for adoption" machines to meet your lifestyle and budget needs. Quilters are welcome to try their hand at vikings new 5 foot frame! yes it may be only be 5 feet but you can still do a king size quilt!!! 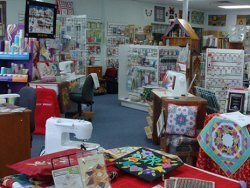 come take a look to see what YOU can quilt . The Platinum 16 sit down or stand long arm comes with its on own table,& stitch regulator, come try both out and see which suits your quilting needs. Want to see and test drive one of vikings beautiful sewing & embroidery machines?? easy solution, let us put you into one of our embroidery classes, experience the fun of completing a wonderful project and meet people who share the joy of sewing! Merri Stitches is committed to providing top-notch customer service. Our talented and experienced staff of sewing specialists is always on hand to treat each customer to extra-friendly, personalized assistance. We also believe in community service, participating in charities that sincerely make a difference in the lives of others. Around here, we look forward to every customer visit! We're passionate about helping sewists, of all styles and skill levels, discover their creative talents and finish their sewing projects with an enduring sense of satisfaction and accomplishment. All of here at MerriStitches is committed to continuing education , we promise to strive everyday to always bring you our Best. Thank You for your loyalty and continued trust in us to meet your sewing needs.